After finalizing our All Pro list, we here at RotoRob.com noticed the high number of teammates who were awarded and briefly considered swapping a few names out; being named an All Pro is after all an individual honour. After careful deliberations we decided that since all our winners have the stats to back up their nominations we should reward the fact that they were good teammates and didn’t complain when it was their teammate’s time to shine. Now without further ado, we present the 2014 RotoRob NFL All Pro Team. Russell Wilson, Seattle Seahawks: Wilson admittedly does not have the total season numbers of some other top quarterbacks. However, elite passers Andrew Luck and Aaron Rodgers were huge disappointments to their Fantasy owners in December, while Wilson surely won many leagues with his Week 16 performance (339 yards and two touchdowns through the air and another 88 yards and a score rushing). Not bad for a “game manager” who’s living in “theIncrease” (see video below… not that it explains anything). DeMarco Murray, Dallas Cowboys: Murray’s 1,845 rushing yards in 2014 set a Dallas Cowboys single-season team record. Yeah, if you have a better season than Tony Dorsett, Herschel Walker or Emmitt Smith ever accomplished that pretty much makes you a no-brainer for any All Pro list. Le’Veon Bell, Pittsburgh Steelers: Bell’s importance to the Steelers’ offense was painfully obvious when he missed Pittsburgh’s playoff loss with a hyperextended knee. With an 83-854-3 line through the air to go along with his 1,361 yards and eight scores in the running game he proved to be the epitome of an every down back in 2014. Dez Bryant, Dallas Cowboys: Aside from the painful, controversial drop in the playoffs that ended Dallas’ season, Dez did have a great campaign in his contract year. He had a career-high and league-leading 16 touchdowns despite seeing fewer targets than in any year since 2011 and did everything possible to prove that Dallas owner Jerry Jones should invest long-term in his brightest star. 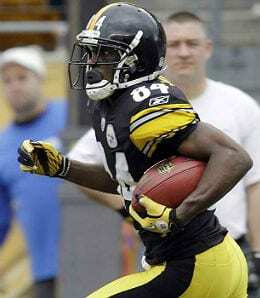 Antonio Brown, Pittsburgh Steelers: In a league dominated by tall (six-foot or taller) receivers it’s nice to see a smaller guy like Brown (5’10”, 186) lead the NFL in receptions with 129 and receiving yards, gaining a whopping 1,698. Rob Gronkowski, New England Patriots: While Jimmy Graham was the only tight end regarded as a first-round pick in Fantasy drafts last summer, he struggled through a shoulder injury most of the year that limited him to under 900 yards for the first time since his rookie year in 2010. Gronkowski, on the other hand, finally shook the injury bug and ended up far and away the leader at the position with 1,124 yards and 12 trips to paydirt. Andrew Whitworth, Cincinnati Bengals: Quite possibly the biggest Pro Bowl snub, Whitworth did not allow a sack all season. Enough said. Joe Thomas, Cleveland Browns: For too long Thomas has toiled away on a losing team in Cleveland, so it was nice seeing the Browns playing games that mattered well into December. Kyle Long, Chicago Bears: Long’s play was one one of very few bright spots in an otherwise disappointing season in the Windy City. The second-year pro out of Oregon should be a mainstay for Chicago for years to come. Marshal Yanda, Baltimore Ravens: When an older “journeyman” runner such as Justin Forsett has a career year seemingly out of nowhere, a solid offensive line is usually a big reason why. No Ravens lineman has been more impressive in recent years than Yanda. Travis Frederick, Dallas Cowboys: The ‘Boys invested heavily in the offensive line over the last few offseasons, and that may have been the biggest factor in the team winning the NFC East for the first time since 2009. The former All-American at Wisconsin didn’t take much time to adjust to the pro level, earning Pro Bowl honours in this, only his second season. J.J. Watt, Houston Texans: In a fair world where defenders received the same amount of accolades as their offensive counterparts, Watt would win 2014 MVP hands down. Five touchdowns, including three on offense, to go along with four forced fumbles, five fumble recoveries, one interception (that he took 80 yards for a score) and 10 passes defended made Watt the most feared defender in the league. Mario Williams, Buffalo Bills: Williams has not disappointed in his three years since joining the Bills, starting all 48 games and notching double-digit sacks every year, including a career-high 14.5 last season. Marcell Dareus, Buffalo Bills: New Bills head coach Rex Ryan should love the toys he inherited on the defensive side of the ball. Not often does a double-digit sack artist like Dareus (10.5 this season) tip the scales at over 330 pounds! Ndamukong Suh, Detroit Lions: Yes Ndamukong, you made our All Pro team, now please get off our leg! Seriously though, it is a shame Suh’s, shall we say, poor sportsmanship, continues to outshine his All Pro level play. Justin Houston, Kansas City Chiefs: Houston’s 22 sacks last season tied for second all-time, behind only Michael Strahan, who recorded 22.5 back in 2001 (thanks in part to Brett Favre). Von Miller, Denver Broncos: When Peyton Manning is your quarterback, the defense must be able to protect a lead, and a big part of that is being able to get after the quarterback. No other 4-3 outside linebacker even came close to Miller’s 14 sacks. Luke Kuechly, Carolina Panthers: After RotoRob.com crew favourite Kilo Alonso went down with a season-ending injury, Kuechly no longer had any serious competition for this spot. No player in the NFL bested his 153 tackles in 2014. Richard Sherman, Seattle Seahawks: Not only did Sherman continue to dominate receivers on the field, but his extremely well written opinion columns silenced most critics who tried to label him a “thug” after the infamous post-49er-game interview in last year’s playoffs. Darrelle Revis, New England Patriots: Finally healthy after years of struggling through and recovering from injuries, Revis was truly back to form in his one-year “audition” with the Patriots, and the decision of whether or not to re-sign him will be one of the most highly debated topics in Massachusetts this offseason, other than the deflated balls controversy, of course. Earl Thomas, Seattle Seahawks: No disrespect to Sherman, but while the cornerback continued to dominate headlines in 2014 we believe the play of safeties Thomas and Kam Chancellor were just as big a factor in the Legion of Boom continuing to be the most feared secondary in years. Eric Weddle, San Diego Chargers: Weddle’s talents sometimes are overlooked in favour of flashier safeties, but leadership is something that doesn’t show up on stat sheets. As the only starter in the Chargers secondary currently under contract for 2015, Weddle may be relied upon even more heavily next season. Stephen Gostkowski, New England Patriots: We could have simply flipped a coin between Gostkowski and Adam Vinatieri. Instead we decided to go with Gostkowski, mostly because he plays his home games outdoors, raising the difficulty level for many of his kicks. Marquette King, Oakland Raiders: Amazingly, out of King’s league-leading 109 punts only three went for touchbacks. Conversely, 31 of his punts were downed inside the 20, and 33 were fair-caught, limiting opponents’ return opportunities. Devin Hester, Atlanta Falcons: Hester’s 1,128 kick return yards was not only the best in the league, but no other player even topped 1,000. Don’t blame Hester for only having 18 punt returns on the season, as the defense actually has to stop the other team to force punts. Not his job. Now it’s your turn. Let us know in the comments below who you would have picked as All-Pros for the 2014 season. On this week’s episode of RotoRob Fantasy Football Weekly Podcast, heard every Wednesday at 1:30 p.m. on Blogtalkradio, Nick Wagner and Josh Johnson were joined by LauraLeigh Majernik of AltCon Radio.